It is that time of year again when football teams are preparing themselves for the start of the new season! And that can only mean 1 thing!!! The Ruff Gaming Fantasy Football League is back!!!! Same as last season we are using the official English Premier Leagues Fantasy Football - www.fantasy.premierleague.com for our fantasy managers to do battle over the title of the Ruff Gaming's Fantasy Football League! Last season saw X Bulldog take the title (Once again) and the challenge will be set this season if anybody can take the title from him (we failed last season!). If you are new to this fantasy football it is really simple to sign up and take part! Go to the above website, sign up (Its free and all you need is an Email address), make your team then take our private league code - 737933-180899 and enter it in the leagues section of the website. And that is it! 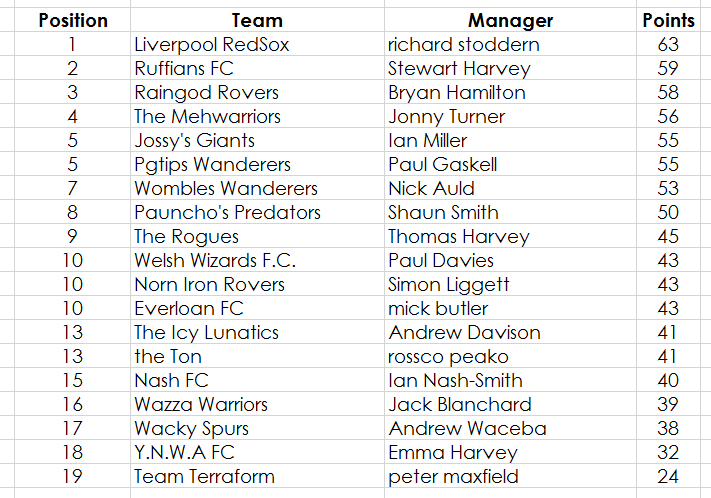 Once you are all signed up you can post your team name below here so we know who is who and then get managing your team! Feel free to use this thread to chat about our fantasy football league as the season goes along and also ask any questions you might have on the league. The prize is a place in the hallowed Ruff Gaming's Hall of Fame! I'm in, Welsh Wizards F.C. ICEMAND18 wrote: Can you double check it's brought me into the league? Looks like it automatically put me in it? Been added "automatically" as well...the question is, after 2 really good seasons can I keep this up...hmm looking at my team I have a bit of a doubt...Liam Bridcutt, Matthew Upson, Jan Hooiveld anyone...ANYONE???? Jay Fulton??? Still no-one? Ready to prop up mid-table as usual! Wacky Spurs all signed up. My team is Y.N.W.A FC! I know over the past few seasons I've forgot to manage my team properly hence my awful finishing positions (that's my excuse and I'm sticking to it!) but doing some digging this morning and there is an app for Fantasy Premier League. Now I followed a link from the main site for andriod where there are links for Android, Apple and Windows. It cost me £1.20 and it seems to work really well. It looks a pretty new app so there are a few bugs. Somehow Iam 2nd - only 1st week but nice to be up near the top at least once! Don't forget everybody gets a free transfer each gameweek that doesn't effect their points total - still needs to fit into your budget though! I needed to savour this moment, even if it's just for today! How's everyone fairing so far? The only reason I'm getting points is Deigo Costa... I just can't seem to get a decent balance.